"One of the things that were apparent to me working at Bayer is that there was so much beyond our borders, a lot of exciting ag tech out of there, a lot of passionate entrepreneurs trying to make a difference and bring new solutions to agriculture," Percy said. "However, when I left Bayer a few months ago, I dived in and began working with many new technology providers across the globe who are looking to bring new solutions to various areas of ag tech. I desire to help and advise them." 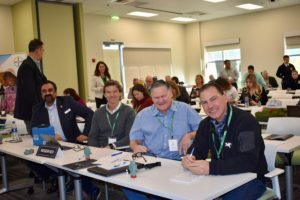 AgTech Experts At Recent AgTechx Event at Bayer Crop Science's West Sacramento Research Facility, sponsored by Western Growers Association. Digitalization is clearly going to be one of those new areas in agriculture, and basically, it's going to help ag in many ways. "I think our growers make more informed decisions about how to manage their crop, and so whatever type of crop that will be, whether it comes to time for harvesting and other areas, I think this is all going to be enabled by digital tools," Percy explained. "Do you take the use of drones with high-resolution visualization cameras? There are companies now that can detect insects that are less than half a millimeter," Percy said. “You may be able to detect the arrival of early disease pressure in a field or early insect infestations and perhaps send out another drone to zap those critters and protect fields with minimum use of crop protection chemistry," Percy continued. "They may have to share their data to trust in that process, and a lot of companies are working on how they can build that trust with growers," Percy explained. "I think the fundamentals have always been strong. I know we go through periods of difficulty with low margins and commodity prices, for example, which are not strong right now, but the need for the future and the need for sustainable farming is always going to be there."